This is one of Dorothea Lange's photographs of migrant workers and rural poverty in the Yakima Valley. Click to see the full collection. Courtesy Library of Congress, Photographs Division, FSA-OWI Collection The Great Depression in Washington State Project is a multimedia web project based at the University of Washington in Seattle. It represents a collaboration between faculty, graduate and undergraduate students, and community members. Funding for the project has been generously provided by the Simpson Center for the Humanities and the Harry Bridges Center for Labor Studies at the University of Washington. This site joins a collection of Pacific Northwest Labor and Civil Rights Projects based at the University of Washington and directed by Prof. James Gregory. The Project provides an accessible and teachable resource for exploring the vast changes in Washington State during the Great Depression. It also encourages us to think about the relationship between past and current economic crises and the opportunities for history making that can follow. The Great Depression in Washington State Project involves a series of undergraduate courses in the History Department, in which students generate the research reports available here, along with companion classes in the School of Drama where students prepared readings of two Depression-era plays which were performed February 18-28, 2010. • "UW Project Explores Great Depression's Impact on State," by Sanjay Bhatt. Seattle Times, February 20, 2010. Everything on this site is protected by the copyright laws of the United States and the Universal Copyright Convention. Photos, drawings, documents, maps, timelines, reports, and articles are the property of the donors and authors and may not be reproduced. Introductory writings and other materials are the property of the Great Depression in Washington State Project and may not be reproduced without the written permission of the director(s) of the Great Depression in Washington State Project. If any copyright owner objects to the use of any work appearing in these pages, notify us and we will promptly remove it. Nothing on this site may be reproduced without the written permission of the director(s) or project coordinator of the Great Depression in Washington State Project. This is an educational, non-commercial site. All materials on these pages (including all texts, images, descriptions, etc.) are for the personal and educational use of students, scholars, and the public. Any commercial use or publication of them without authorization is strictly prohibited. Teachers and students are granted permission to print materials from this site for classroom use provided that the Great Depression in Washington State Project is properly credited. 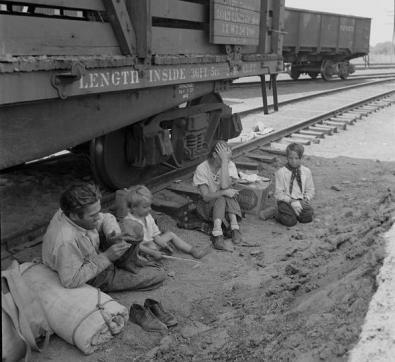 Author if available, article or page title, The Great Depression in Washington State Project. Retrieved (date you retrieved the information) from http://depts.washington.edu/depress/ (add the complete URL for the specific page).